There is a toilet in Gawsia that smells like flowers. It is clean, bright and flooded with sunlight. And it is solely for women. This toilet exists because of the efforts of Bhumijo, one of five teams to win BRAC’s first Urban Innovation Challenge. Bhumijo made a dull, dark and dreary bathroom into a little oasis for women in just three weeks. Two of the members of the group are architects, and their work was supported by seed funding and incubation support by BRAC. How serious is the public toilet crisis in Dhaka? People who haven’t resided in Dhaka may not understand just how distressing it is for women when they need to use public toilets. Dhaka is the most stressful city in Asia, and it is worse if you’re a woman. It is common to hear mothers telling their daughters to not drink water when they’re leaving the house, and a survey conducted by Bhumijo has shown that 80% of girls follow this advice. 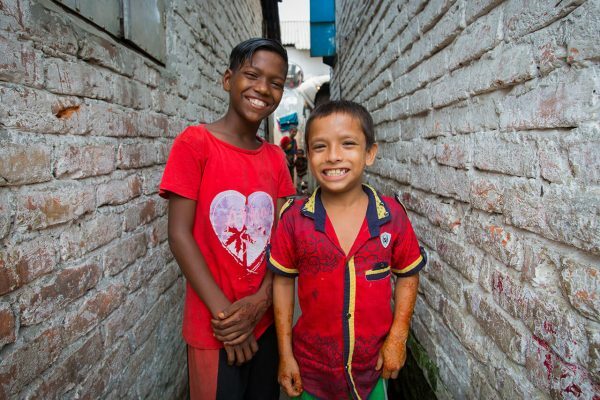 The issue isn’t just the lack of toilets in Dhaka, it’s also that the existing ones are in awful condition. They are squalid, congested, and dark. Many are not functional. Some toilets are used as storerooms and even sub-leased for shopkeeping. Avoiding to urinate is one of the major causes of urinary tract infection, a disease which women are already more susceptible to than men. What makes Bhumijo’s initiative worth celebrating? Bhumijo’s initiative is renovating existing toilets in places frequented by a large number of women. No additional land is required for this, and spaces and resources previously being misused will be used properly. No new service lines are required and the toilets can be transformed relatively cheaply. This project cost only BDT 500,000 (USD 6,055). 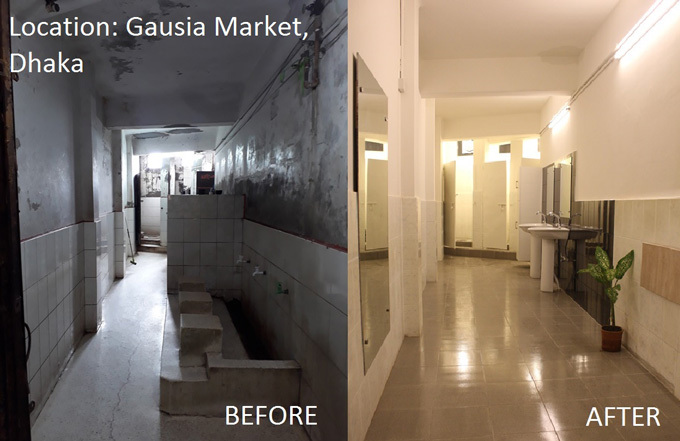 Gawsia was chosen after extensively surveying 32 places with the highest concentration of people across Dhaka. The market has everything, from tie-dyed sarees to gilded jewellery, and is one of Dhaka’s biggest shopping hubs for young girls and women. Before Bhumijo’s initiative, however, it had no toilet which women felt comfortable using. Thousands of women came to Gawsia every day, and they all came knowing that they would not be able to eat or drink anything, or their day would be agonising. What does the new toilet look like? 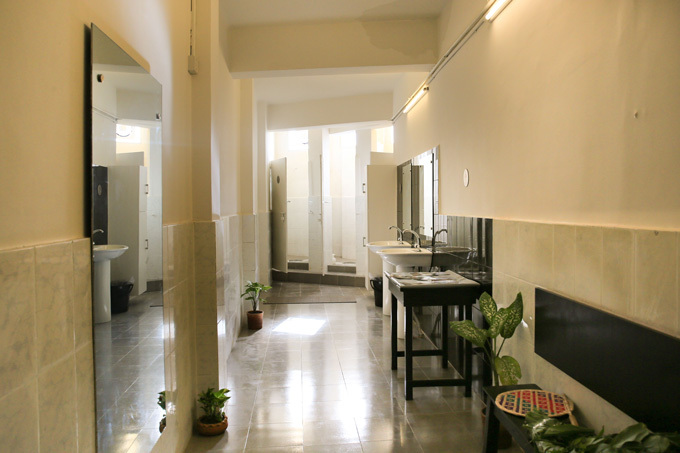 Located on the second floor of Noor Mansion in the Gawsia market, Bhumijo’s toilet stands in stark contrast to its surroundings. The area outside has chipped paint, exposed wires and spider webs all over the ceiling. The toilet has smooth, clean and bright white walls. Sanitary pads and special facilities for babies are available. The team has also placed benches outside the toilet. Bhumijo co-founder, Farhana Rashid says that the toilet is more than just functionality, it is also a place where women can rest safely. Farhana Rashid recounts her own experience of using public toilets, “I can say from my own experience that no woman would like to go through such ordeals.” Instead of telling women to not drink water, Farhana took it as a challenge. The toilet is open to all women who wish to use it for a small fee of BDT 10. 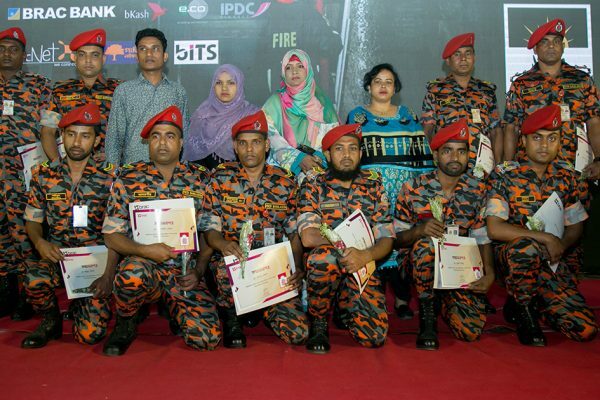 Research has shown that the majority of the 2.5 million women in Dhaka are willing to pay – and the initial enthusiasm proves the same. With the proceeds from the entry fee, a female attendant will be hired to ensure that the toilet remains clean. Bhumijo and the market authorities are jointly accountable for its maintenance, employing a supervisor to monitor the condition of the toilet on a daily basis. Dhaka’s population growth is not slowing. Bhumijo’s initiative is starting a much-needed discussion about ensuring that sanitation facilities improve with that growth. 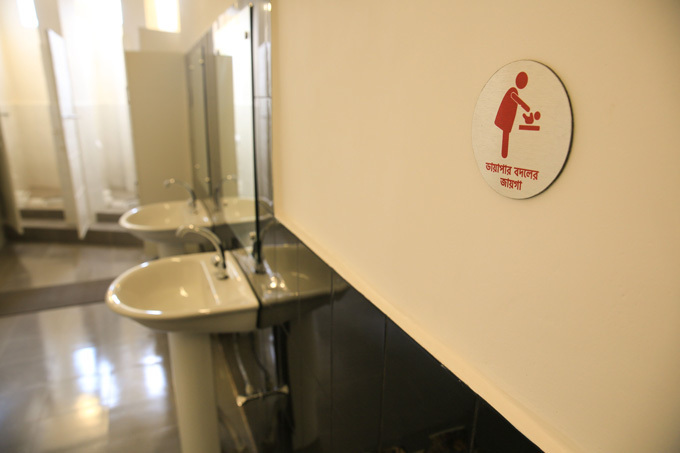 Bhumijo isn’t just creating toilets, they are brewing a revolution for women – starting with safe and hygienic toilets. Aliza Hridulaa is an intern at BRAC Communications.